India coralbean is a kind of defoliated arbor and its native land is the tropical Asia. The trunk of the tree is tall and huge and is luxuriant in branches and leaves. India coralbeans like sunlight, otherwise they will not bloom so well. The florescence of India coralbeans is March. The flowers are bright red shaped like peppers. The anthotaxy is long and big, which looks from afar like ripe peppers. India coralbeans have about 50 varieties; ordinary ornamental varieties include: agrimony, a kind of defoliated small arbor originating in North America and West Indian Isles; torch India coralbeans, a semi-defoliated arbor originating in Southeast Africa; yellow vein India coralbean a famous ornamental plant with golden stripes in its veins; and big-leave India coralbean, a defoliated small arbor originating in South China, which can also be found in India. India coralbeans are suitable for planting in lawns or beside buildings to beautify parks, greens, and landscapes, and they are also a superb kind of trees to be planted along roads or streets. The wood of India coralbean is white, light and soft, which can be used to make wooden slippers or toys. The leaves, barks and roots of India coralbeans can be used as medicines because they have the effects of clearing heat and diuresis. In the past, India coralbeans were treated as a mark of time. For example, 300 years ago, when the Chinese people of the inner land migrated to Taiwan to reclaim, they found that the native Pingpu folks of Taiwan had no calendars at all, and even had no years, so they could not tell the seasons of a year at all. They regarded the flowering circle of India coralbeans as one year and they led a happy life. According to the old custom in some places of China, the folks once forecast the yields of the coming year based on the flowering situation of India coralbeans. If the India coralbeans of the first year bloomed late and the flowers were verdant, they would believe that in the coming year they would have a good harvest and their domestic animals would be prosperous. Otherwise, they would think coversely. 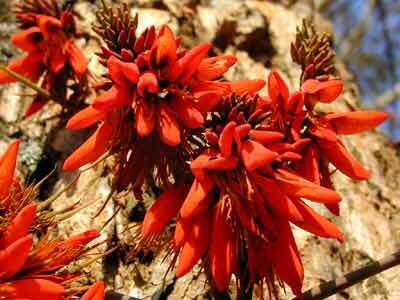 The people in Argentina all like India coralbeans, and select India coralbean as their national flower. This might have relation with an ancient story. It is said that many places in Argentina often encountered floods; but what is strange is that floods did not go to places where there were India coralbeans. Therefore, the local people regarded India coralbeans as their protecting gods and planted them everywhere. What is more, they selected India coralbean as their national flower. On New Year�s Day each year, the people of Argentina will scatter many India coralbean flowers on water surfaces, and then they will jump into the water and rub their bodies with these flowers, which means washing away the whammies of the past and having good luck in the new year.